Mickey Moniak is less than a year removed from making his pro debut but has already displayed growth as a hitter as a teenager in the Sally League. LAKEWOOD, N.J. – Mickey Moniak spent a decent chunk of his teenage years traveling the globe as a budding baseball prospect, from playing in elite travel tournaments to going to Japan and Taiwan as a member of the USA Baseball’s 18U National Team. Do you want to take batting practice at Citizens Bank Park? Is Jorge Alfaro doing enough to open the Phillies' eyes? But a month ago, for the first time in his life, Moniak wasn’t going on a trip but setting up a semi-permanent home (at least for the spring and summer of 2017) in Ocean County, N.J., nearly 3,000 miles from where he grew up in suburban San Diego. Thankfully, Moniak, who turns 19 in two weeks, has a solid foundation in his family. His mother, Heather Moniak, hung out in Lakewood Township, N.J., during the busy week when her son was making the transition of unpacking his things after two months in Clearwater, Fla., and setting up a home base with the Low-A Lakewood BlueClaws in early April. “Having her here was nice, she helped me get settled into the apartment. Because we don’t really get much time to find stuff, so it was nice having her do all of that,” said Moniak, who found a place he’s sharing with teammates JoJo Romero, Bailey Falter, and Kenny Koplove. Upon breaking minor league camp in Clearwater, Moniak and his BlueClaws teammates immediately hit the road for a season-opening trip through North Carolina (Kannapolis) and Maryland (Hagerstown). The Phillies’ Low-A affiliate spent the majority of the season’s first three weeks on the road, also traveling to West Virginia (Charleston) and Maryland again (Delmarva). The travel is mostly a new experience for players in the South Atlantic League, particularly if they are kids like Moniak, less than a year removed from the MLB draft and a summer in the Gulf Coast League in Florida. “Just having family here anytime is good,” Moniak said of his mom’s well-timed visit. The first month in the Sally League went pretty well for the first-overall pick from the 2016 draft. Moniak hit .284 with a .344 OBP in 22 games, collecting five doubles and a triple while successfully stealing four bases in five tries. But it isn’t just the numbers that Phillies' evaluators are looking at when they’re taking stock of the youngest of their growing collection of prospects. It’s a mature attitude for a top prospect to have, especially one that could have opted to spend his last couple of teenage years having fun in college rather than getting his proverbial feet wet as a professional athlete. Malloy, in his first year managing Lakewood, said he often has to remind himself that he is in charge of a fairly young group of players in 2017. He doesn’t ever want to use it as an excuse, but the reality is Malloy has four teenagers on his roster and a total of nine players under 21. But those youngsters, which includes Moniak and budding pitching prospects Sixto Sanchez and Adonis Medina, among others, have adjusted well so far. 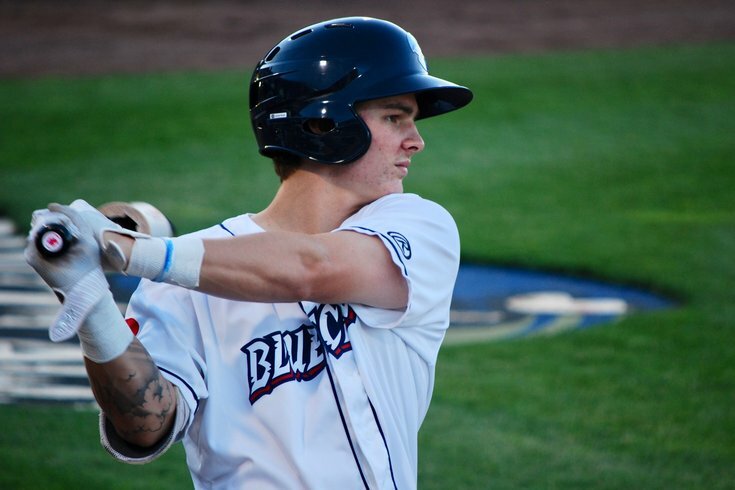 Moniak, No.3 in the latest PhillyVoice Prospect Power Rankings, hasn't become too familiar with his new environs in New Jersey yet simply because the BlueClaws have spent the majority of their time on the road in the early part of the 2017 schedule. But, so far, a year removed from his days at La Costa Canyon (Ca.) High School, he’s enjoyed the new grind that his life as pro ballplayer. “The travel is different, but I’ve enjoyed it,” he said. “I mean it’s not too bad, we each get a bed. You sleep, you show up (at the ballpark). Last year I already got used to playing every day in the GCL, so that’s not too bad for me.